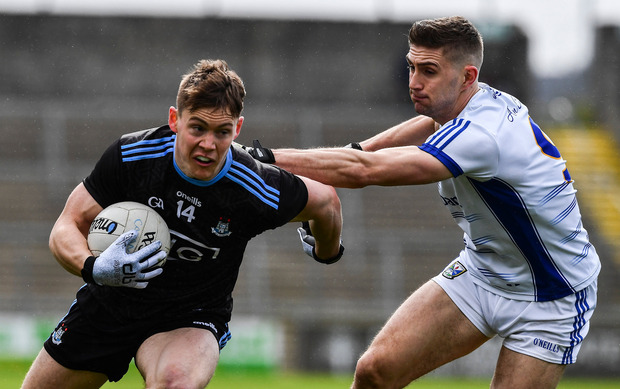 DUBLIN completed an odd League campaign with a tepid six-point victory over Cavan in Kingspan Breffni Park today. The home team suffered immediate relegation to Division 2, although results elsewhere meant even a victory over the All-Ireland champions wouldn't have saved them. For the first time in Jim Gavin’s wildly successful reign as manager, Dublin won’t contest this year’s League final, although they knew that after last Saturday’s unusually meek defeat to Tyrone in Croke Park. Here again they appeared heavy-legged against a Cavan team who required not just a win but a combination of other results to preserve their Division 1 status. Cavan set out to frustrate and constrict. Just two Dublin players; Dean Rock and Paul Mannion, scored in the first half, the former contributing seven of their eight points in that period. At centre-forward, Con O’Callaghan took on the role of battering ram against a robust Cavan defence but Mickey Graham’s team plugged the gaps just as soon as they appeared. Graham situated his two big ball-winners, Gearóid McKiernan and Dara McVeety, in the central attacking positions, with the latter winning an early mark off Cian O’Sullivan and scoring the resulting kick. Dublin’s graft, rather than any real precision or cohesion, saw them work a four point lead by the 29th minute but their vulnerability under a high direct delivery was exploited again here by Cavan. McKieran delivered a speculative pass from the left wing and Martin Reilly rose higher than O’Sullivan and Evan Comerford to palm to the net. Cavan’s goal was the last score of the half and left just a point (1-4 to 0-8) in it at the break. They went level soon after and had chances to nip in front before Dublin scored the goal that turned the match into something of a procession. Rock, by far Dublin’s sharpest forward on the day, either picked out Paul Mannion with outstanding precision or connected poorly with a shot on goal from 35 metres. Either way, Mannion was tuned in, turned sharply and squeezed a shot past Raymond Galligan. Soon after, Kevin McManamon came on and provided real zip to the Dublin attack in his time on the pitch while Philly McMahon and Bernard Brogan both made their first appearances of the season from the bench.